Finally! A Use For Your Old Comic-Con Bags! Just what happens to a swag bag after it's been handed out? Does it simply get used a time or two more, and thrown out? Or maybe it ends up gathering dust in the back of a closet? Or does it, like in this case, transform into something even better than the original? 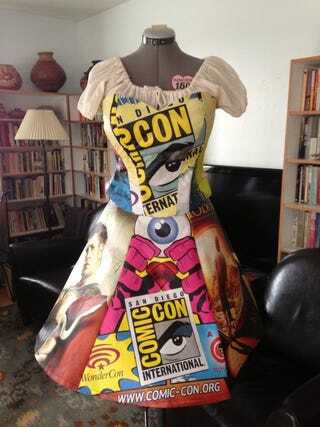 In response to our call to tell us about the projects you've all been working on lately, commenter stellastar42 showed us this dress (complete with accompanying haberdashery) made entirely from Comic-Con swag bags. Show Us What Projects You&apos;re Working On! In addition to the sewing, it took 5 years to assemble enough bags. It's an impressive feat of both fashion and recycling.